Okay, so I made that up… but after two recent visits to Akasha Restaurant in Culver City, it certainly could be the definition! The kind folks at Bread & Butter PR invited me (along with other food-lovers including @EStarLA & @DianaTakesABite) to attend a cheddar cheese event at Akasha Restaurant. FREE CHEESE + AKASHA? I wasn’t going to miss this, so I invited my good friend Charles Thompson to join me. Since Peter’s studio is near the restaurant, he met up with us after work and we spent the next couple of hours eating Akasha’s fromage-filled comfort food. 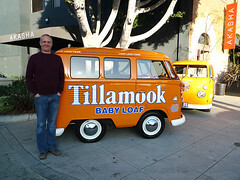 The Loaf Love Tour consists of a trio of mini-buses that are retrofitted from 1966 Standard VW Microbuses to resemble Baby Loafs of Tillamook cheddar. The Tour will stop at various grocery stores, farmers markets, local retailers and special events to teach consumers about Tillamook’s famous cheddar cheese. The Loaf Love Tour will visit 100 cities in 9 different states throughout the Western U.S. as well as Illinois and Texas. Personally, I was so excited to see the cheesy mini-buses in real life. They had been spotted driving around Los Angeles of late, but I hadn’t seen one myself. So cute, they reminded me of delivery trucks in Japan. 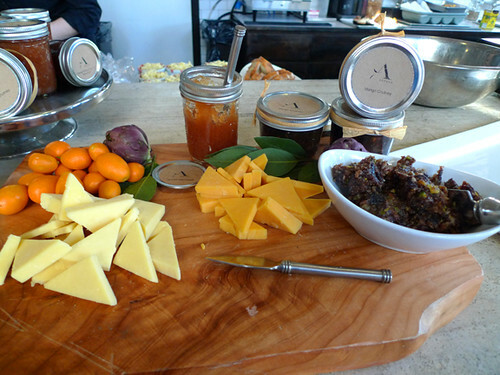 Of course we started off the evening with some tasty Tillamook cheeses and Akasha’s fresh preserves, including kumquat. Since it was Happy Hour, I figured I may as well buy myself a cocktail! 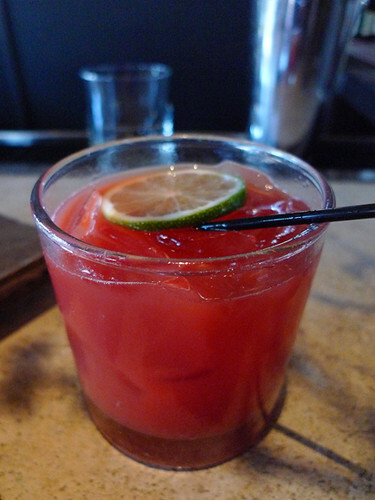 Loved this RED VELVET MARGARITA: Copas organic tequila, lime juice, blood orange juice, agave nectar. I’m not a fan of sweet drinks, so this was perfect. 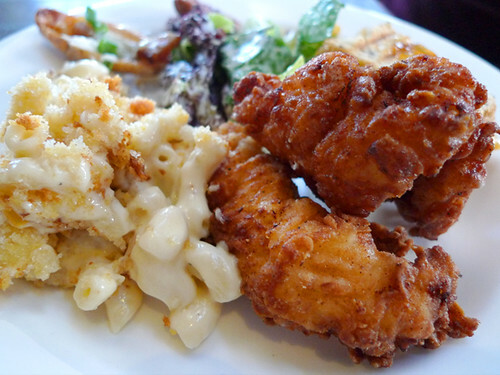 Is there anything BETTER than classic Mac & Cheese with perfectly Fried Chicken? I’d had Akasha’s Mac before but this was my first taste of her chicken. Both fantastic. I put some salad on the plate “for color” in the background, but after one bite I went back for seconds. The cheesy croutons Akasha made were also AWESOME! 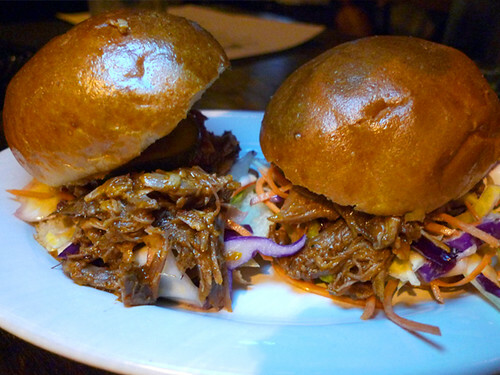 I thought we were finished eating, but then Akasha’s husband Alan asked if we’d tried the Pulled-Pork on BISCUITS… Of course I found room for a few of these! After the Tillamook folks packed up and hit the road (I waved as they sped around the corner! ), we sat with Akasha and Alan over drinks with Sergio (who works with Akasha) and BBPR’s Dyan. Ludo’s Chicken Balls are hard to come by, and when news of their “special appearance” hits the internet (by way of Twitter), there’s always a bit of panic in the air. 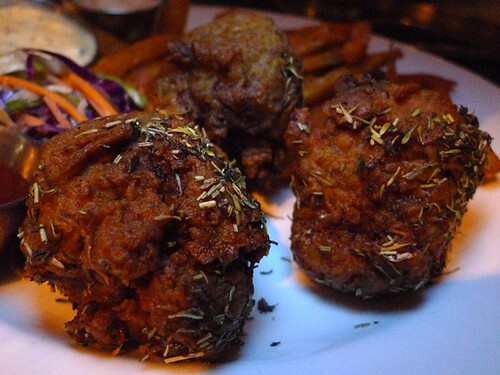 The LudoBites Fried Chicken Night at Akasha Restaurant sold out as quickly as the first, which was held at The Foundry on Melrose back on March 2nd. We each got THREE pieces of Ludo’s Big, Juicy, Fried Chicken Balls (at the Foundry, it was only two) and choice of sides. 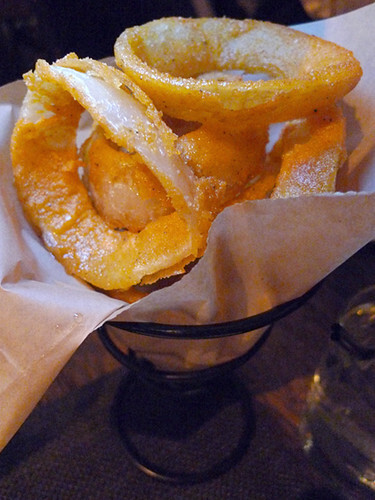 Besides the extra onion rings, we shared sweet potato fries and coleslaw. In Hinduism Akasha means “the basis and essence of all things.” In my mind that’s sort of the definition of good, old-fashioned comfort food, and that’s exactly what an evening at Akasha’s feels like, especially after a stop at the fantastic bar. See you there soon! Too bad we couldn’t take a ride in a mini-loaf!! It was so fun hanging out with you, Peter, Charles, and Esther on Thursday night. 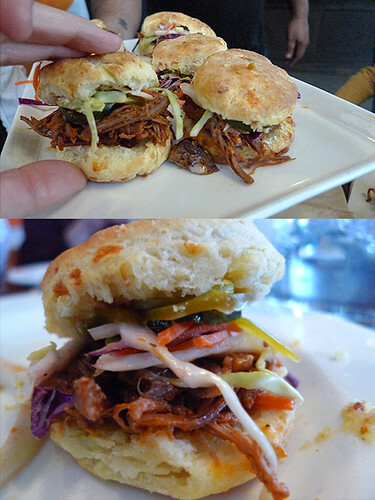 Those pulled pork biscuits were ridiculous! Hope we can share more meals together in the future! Pulled pork on buscuits . . . . evil genius. The pictures look fantastic, Jo. So sorry we missed out on LFC night. Definitely hope he does this again sometime. His fried chicken is incredible. I had fun hanging out with you, Charles, Diana and Peter, Jo!! 🙂 Nothing brings people together like cheese and chicken!! It never fails, every time I read your blog; you put a huge smile on my face!!! Gah! This post is taunting me with its cheesy goodness. Everything looks delicious! How was Akasha’s mac n cheese? 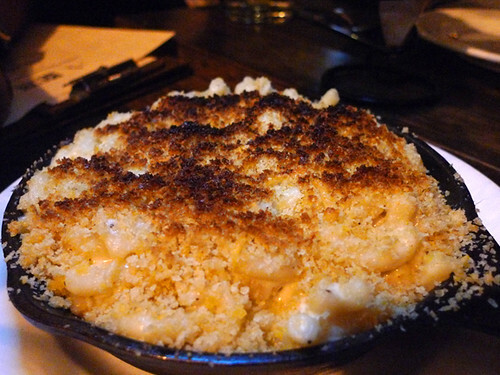 Great mac n cheese is one thing I’ve yet to find in LA. Loved it. Especially with the crumble, crispy top! very good blog, keep it the good work all articles are good to read..